This top rated weather radio comes with multiple power options so you can always receive the latest NOAA updates, and listen to your favorite AM/FM stations. The rechargeable battery is designed to be easy to replace, and it can also be used to charge your portable devices thanks to the USB output. It even comes with a SOS flashlight, along with an ultrasonic whistle to signal emergency personnel. Some consumers have mentioned that they wished the compartment for the lithium ion battery was a little larger since the tight fit can make it difficult to replace. While this doesn’t affect the weather radio’s overall performance it is a design flaw that could be improved. One of the reasons this top rated weather radio is a favorite with consumers is the fact that it comes with multiple power options. You can easily switch between AA and the rechargeable lithium ion batteries or use the convenient hand crank. It also comes with a solar panel which is always an advantage when the electricity is out. With several power options you don’t have to worry about missing an important weather update. Not only is this a weather radio, it can also pick up local AM/FM stations so you can stay entertained. You also don’t have to worry about missing an important NOAA update since the radio will sound an alert whenever a weather bulletin has been released. While you can’t preset your favorite stations, they are extremely easy to tune in. There is a convenient USB output which allows you to charge your portable devices, this ensures that you will still have a cell phone even if the power is out for an extended length of time. 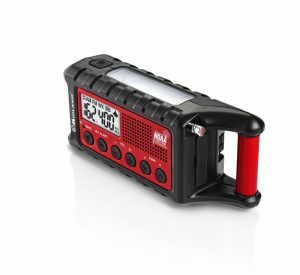 The handy flashlight can be set to flash “SOS” in Morse code, and if search and rescue teams still can’t locate you this weather radio comes with an ultrasonic whistle. 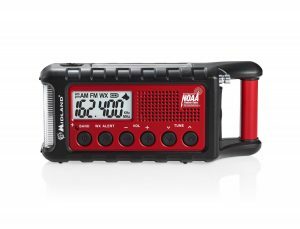 This durable weather radio is designed to be easy to use, which is always an advantage in an emergency. The bright screen clearly displays battery power levels, along with the the AM or FM station and the NOAA frequency. Since it is easy to keep an eye on the battery levels you will always know when it is time to switch to another power source so you never have to go through an emergency weather situation uninformed. The buttons are clearly marked so operating this weather radio is a breeze, even when the power is out. While it is a little bigger than some similar models this weather radio is still designed to be compact and easy to carry. It fits easily into a backpack with the rest of your gear so you can take it camping or into a convenient drawer at home with the rest of your emergency supplies. There is even a handle for easy carrying or to hang it from a hook or tree branch.